Every day feels like a vacation at Harbor Lakes where custom homes hug the shores of Lake Granbury and residents enjoy the country club life. Just minutes from historic Granbury and within 40 minutes of Fort Worth, Harbor Lakes is your destination for a permanent home or vacation retreat. From pitch and putt to plunge, Harbor Lakes has it all including a pool with cabana, and golf club featuring an 18-hole course, pro shop, driving range and restaurant well above par. The Harbor Lakes Owners Association is a non-profit corporation that exists to help preserve property values through architectural controls, design guidelines and deed restrictions. The HOA provides for the maintenance of all common areas and community amenities through collection of dues. HOA dues are collected annually. Texas Star Community Management is responsible for hiring and overseeing the maintenance contractors with approval from the HOA Board of Directors. A Board of Directors are elected annually by you, the neighborhood. A Board of Directors Meeting is conducted monthly and there is also an Annual HOA Meeting each year. 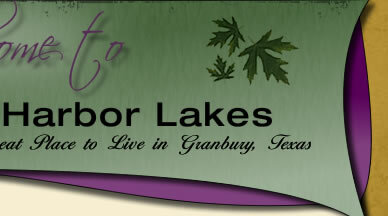 Harbor Lakes Owners Association is professionally managed by Texas Star Community Management.